This is a short summary of what we all need to bear in mind as we go about our running in the Peak District. It does come out as a list of do's and don'ts so I would encourage you to read the more detailed accounts below, to get the complete balanced view. Open Access – the CROW Act gives us access to all areas which have been mapped as Access land. This generally means all mountain and moorland. Access land is shown on the latest OS 1:25000 maps. Use stiles and gates to get onto access land. These are shown on the latest Harvey 1:25000 maps, but not OS maps at present. Try to plan clubs runs and club races using official access points. If there is no stile or gate, you are still legally entitled to enter access land as long as you don't cause any damage to walls , fences etc. Consider carefully before doing this, we need to maintain good relations with farmers and landowners. Use public footpaths to cross enclosed fields. Try to avoid planning club race routes which cross enclosed fields, runners are bound to get lost or be tempted by short cuts. Dogs must be kept on a short lead during the nesting season (1st March to 31st July). Dogs must be under control at other times. Many shooting estates have a complete ban on dogs. Here is some information about the practical implications of the CROW Act and some of my personal opinions about how this might affect our running in both club runs and club races. I've also written about the historical context of access and how the ethos of the club has developed. Everyone was a new member once and I've written about what it was like for me to join Dark Peak here. Of course this is just one view, which I'm sure is biased and I'd love to hear your views, both from new members and old crusties. Contributions to the newsletter editor or webmaster please. The Countryside Right of Way (CROW) Act 2000 gives the public a right to access on foot land which has been mapped as “Access Land" and is shown on all up to date OS 1:25000 maps. Access will usually be via a stile or gate. What happens if there is no stile or gate? (b) he observes the general restrictions in Schedule 2 and any other restrictions imposed in relation to the land under Chapter II." I haven't followed through all the conditions mentioned in this paragraph, but it does tie in with the answer given to this specific question, that I put to the Peak Park Access Officer. He said that access land can beentered by climbing a wall, fence etc providing no damage is done. Obviously if there is an access point then this should be used. CROW Act says a landowner has to provide "reasonable" access. If we look at the example of some of the moors near the Sportsman, access points are probably every 1 mile around the boundary, is this "reasonable" or "unreasonable"? This landowner has refused requests to put in extra access points. The tenant farmer and gamekeeper have said in the past they accept that people will access their land by climbing over fences, their only request was that they were informed if any fences became worn or damaged and they would then repair them. They do not want to put in any more official access points because they think it would attract vast numbers of people who would cause damage. The example of National Trust land is different. Nat Trust say they have followed up a large number of requests for extra access points and feel that this process is really at an end now. The clear message from the large organisations such as Peak park and Nat trust is that groups such as ours and individuals should respect farmers, respect their land, their walls, fences and gates. If in turn farmers do not respect reasonable behaviour and the rights of the public, then rangers and wardens are on hand to negotiate a solution. My own view is that this is not about banging our fists on the table shouting for our rights, but about being able to get on with people who live and work where we run. There is a huge amount of easily accessible access land for us to race and train over and this is where we should go. We need to think very carefully about planning routes that cross enclosed fields, particularly for races, where I know for myself, racing takes over everything and other considerations are lost. The nesting season is 1st March to 31st July each year. During the nesting season dogs must be kept on a short lead at all times. Outside the nesting season, dogs must be under control. There are several shooting estates, particularly on the eastern side of the peak district, where dogs are banned completely. The last few years has shown that if dog owners don't follow these instructions then eventually there will be a confrontation with a gamekeeper, farmer or warden and the whole group accompanying the dog owner will get a b***ocking. The issue of dogs on club races was debated at an AGM a few years ago and it was decided that we would follow the FRA guidelines, that is, no dogs at races. Yes we do have the legal backing of the CROW Act to enable us to run freely over the moors, but we also rely on a tremendous amount of goodwill from the people who live and work in our area. We do not have and do not want a rule book in our club, it is up to each of us as individuals to act in a reasonable way. It is no fun for me or any club official to have to tell people what is or is not acceptable, all of us run for pleasure, not earache. So if you're not clear about anything just ask. What you do on non-club outings is up to you. I joined Dark Peak in September 1984. 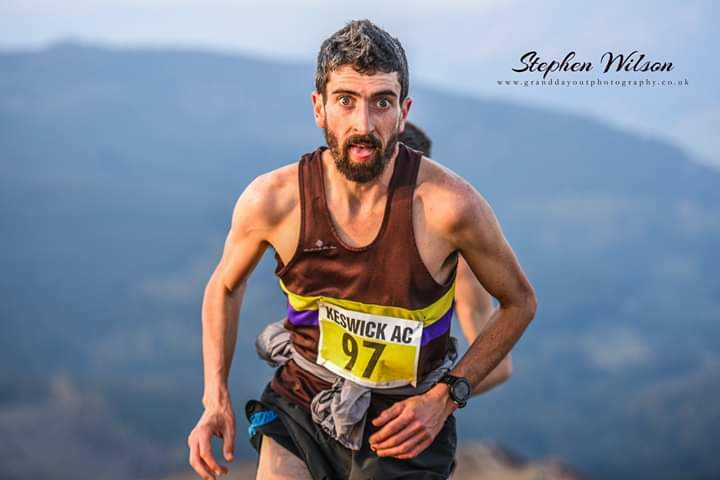 The club seemed well established with a mix of very fit athletes, orienteers, some real all-rounders who thrived on cross country, track and road and plenty of more normal, slower and older runners. Every Wednesday night run was from the Sportsman and I soon learnt that the last couple of miles was an all out sprint for the club hut, so finding my way back on my own was essential. Then, as now, it seemed that Wednesday nights were a chance to forget about conforming to the restrictions of work, home life and family and were a chance to enjoy the freedom of a wide open, natural environment with a bunch of like minded people. Having seen the term “access land” on some of the OS maps of the time, I naively thought that this applied to all moorland, but I soon discovered that we found regular access points to the moors which all seemed to involve a bit of fence that had the barbed wire missing or a gate that was easy to jump over. All the moorland near the club hut was privately owned, but there was really no evidence on the ground to show this, no “private” signs and no confrontations with gamekeepers. The only incidents I can remember from that time involved fenced in farmland and livestock (nothing much has changed then). The only moorland where we were actually welcome was the national Trust owned kinder and bleaklow, along with burbage and a small part of stanage. Big moor was private as was the peak park owned carr head rocks. After a couple of years, there were two incidents which really made people think about what we were doing. First of all the tenant farmer who lived at the edge of one of the regular moorland routes took out his shotgun and blasted the trees above a bunch of runners. The way the club reacted was very much to stick up for what we saw as our moral right to access this land. The club secretary met the landowner and it was agreed that shooting runners was really not on. We continued our running, a little more discretely, further up the hill out of sight of the farm. The second incident involved land owned by the recently privatised water companies on a route affectionately known to us as the trespass. This time we received a letter. I don’t think any meetings took place, but after a pause, we continued our running as before. 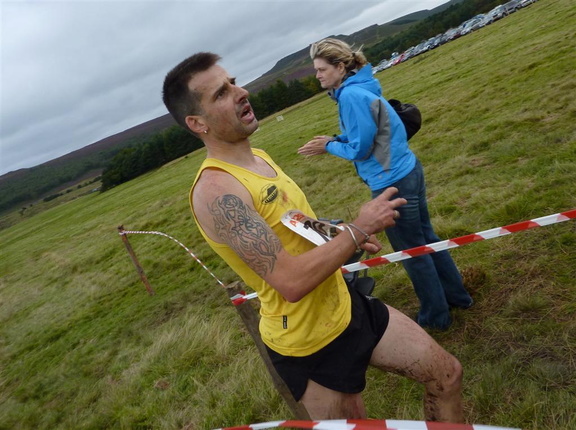 These incidents led us to change our calendar and adopt regular away runs, with cutthroat bridge and longshaw carpark becoming Sportsman substitutes. A series of summer evening races also started with crookstone, cakes of bread and four springs being some of the first. At this time there were only a handful of FRA evening races such as Hope, Bamford, Bradwell and Hathersage in the course of a season. For some club members an appreciation of the natural environment added to the experience. In the ten year magazine (1986) Andy Harmer wrote of skylark, plover and hare. “The sandy area between west end bridge and Grinah stones is a great place for the only green butterfly, the green hairstreak, to see them dancing in the May sunlight is worth a sojourn that way”. Are they still found here? In the late nineties, with a labour government in power the debate on the Right to Roam resurfaced, pushed by the Ramblers association. You might think our club was completely in favour of the proposed legislation, but you couldn’t be further from the truth. Pretty much the club was split 50/50 on this. An AGM brought out many of the arguments, but as far as I could see, many people thought we had been trespassing for so long on these moors, that it was as if we had a private agreement with the landowner. Dave Chellone of SCAM (Sheffield campaign for access to moorland) describes publicising a trespass and meeting the landowner at a shooting cabin. “As usual the conversation that ensued was civil and ended with the landowner sending us on our way and wishing us well”. The Clarion Rambler of 1915 quotes Halliwell Sutcliffe’s, “The Gentle art of Trespassing – Like all games it has strict rules and also it’s more delicately shaded laws of etiquette”. This for me sums up the rationale of many club members at the time. That said I did go to the Houses of Parliament along with ramblers and other interested parties to meet with some of the more radical Labour MPs who were pushing this Bill. The CROW Act came onto statute in 2000, but there followed a period of mapping access land so it wasn’t until September 19th 2004 that it officially came into force. From that time, all mapped access land is open to the public, which really means all mountain and moorland. The most significant thing that changed for us over this period was the attitudes of Grouse moor landowners. I don’t know if it was a combination of backs against the wall during 13 years of labour government along with a worldwide property fuelled, booming economy, but landowners certainly seemed to grasp that they could charge clients thousands of pounds for a day’s shooting. Of course this means that there has to be the grouse to shoot and this filters down into a much more pressurised environment. Gamekeepers control predators by shooting or trapping, for example crows and foxes, but this has also spilled over into the controversy around persecution of raptors. A couple years after the CROW Act came into force, local landowners asked to meet to discuss running over their land during the nesting season. This was something of a watershed for the club, with landowners coming to us, rather than us being summoned and it was up to us to volunteer a restriction or not. Also this brought home to many that we were no longer ”below the radar”, but recognised and known. The situation with local landowners is still not fully resolved. The legislation is clear on the rights of an individual to access land, but more vague when it comes to groups. Certainly for any official organised event (eg FRA race) permission must be sought. We have argued that our club runs and races are not organised events and it has been generally accepted that this is the case. However landowners and conservationists are very suspicious of groups such as ours, so I and other club members have spent a great deal of time trying to show that we are responsible recreational users, who consider all aspects of the environment. We might have thought we were anonymous back in 1976 or 1986, but this is no longer the case. Today if we upset a farmer during a race, our chairman gets an email before the race has even finished. These are some of my recollections and views and I hope they are helpful to club members. I look forward to hearing what you think. The Moscar Estate will be exercising its right to restrict access under s22 of the CRoW Act 2000 again in 2017 to try to minimise damage by trampling and disturbance to the ground-nesting birdlife during its most critical time. The Moscar Estate covers land including Derwent Edge, Bamford Edge and the northern part of Stanage Edge. The restriction does not apply to Public Rights of Way or concession paths. Notices with maps will be displayed at all access points. The crucial time for conservation is the nesting season from 1st March to 31st July. This is the area between the Friars Ridge drainage ditch and Stanage Edge and continuing in this line to behind the Burbage car park. The Peak Park own this land and it's one of the very few areas of moorland where shooting does not take place. Most years two pairs of Merlin nest on this moor - one of the few nesting sites in the peak district. The Peak Park have asked us to avoid this land during the nesting season and that's what we have done for the last 5 years or so. The owners of this shooting moor have asked us to restrict our club runs to outside the grouse nesting season and in a spirit of co-operation we have agreed to do this. In return we are allowed some access to private land - see individual runs for details. This agreement is normally taken care of in the calendar - typically we have a run from Strines at the beginning of April and nothing else until the end of July. And remember that the field at the back of the Strines Inn car park is out of bounds. Section 23 of the CROW Act gives grouse moor owners the discretion to ban dogs from the Access Land for up to five years at a time, renewable on application. Schedule 2 of CROW states that where the landowner hasn't banned dogs, dogs must still be on a 'short-lead' from 1st March to 31st July and at all times within the vicinity of livestock. The above legislation does not apply to Public Rights of Way, where dogs must be under close control at all times. A breach in either Section 23 or Schedule 2 constitutes a trespass against the landowner (technically the person with the dog foregoes their right of access), and may be asked to leave by the owner or his agent (eg gamekeeper). Under CROW Section 2(4) they will not be entitled to go on the land for 72 hours after leaving. There is no requirement for signage, though of course it helps with regard to enforcement. In brief, the dog bans apply on the private grouse moors of the north-east of the National Park, plus other grouse moors such as Offerton/Abney, Combs Moss, Axe Edge and Eyam moors. There are new rules covering the whole of the High Peak - see map below. They do not restrict access for dogs generally, but require the dog owner to remove dog faeces from the area, and also allow officers of the council to require that a dog is on a lead. RSPB have produced two reports recently called Peak Malpractice and PeakMalpracticeUpdate, which highlight the possible illegal persecution of wildlife in the Peak District. It is believed that such persecution has occurred in many areas of the Peak District including land owned by the National Trust. Gathering enough evidence for criminal prosecutions is extremely difficult, but we can help. I was recently involved in a wildlife protection incident and it wasn’t clear to me what I should have done at the time and afterwards. I will try to summarise the advice I received from the Police and RSPB, but before that I would like to stress that almost all the “wildlife management” activities that you are likely to see in the Peak District are legal and legitimate including the use of guns and traps. But there are boundaries that might be crossed which mean the law has been broken. The Police and RSPB do want to know about anybody carrying guns near a known nest site of a protected bird – in our area mainly birds of prey such as Peregrines and Goshawks and Ravens and possibly the Hen Harrier. Deliberately disturbing protected species is illegal. The Police will take action if such incidents are reported, even if no shots were fired. Disturbance can involve merely being too near to nest sites, bird watchers sometimes inadvertently disturb birds by getting too close. In the past, use of off road motorcycles or quad bikes on moorland areas near breeding birds has been a tactic used to disturb / disrupt breeding activity. In short if you witness any activity which to you seems unusual or suspicious both the Police and the RSPB want to know. Derbyshire Police have dedicated wildlife crime officers, who will want you to give as much detail as possible of any incident, firstly of what happened, then other details such as the registration number of any vehicles and very detailed descriptions of any persons involved. Carry a mobile and report the incident straight away (if you can get a signal). Digital photos or pencil and paper to record other details are also useful. You may also see several types of trap, most commonly a crow trap, which is the size of a greenhouse, made of wire mesh. These might be baited with a dead hare or with a live bird from the crow family (not Raven). These traps should have food and water in them. They can be legally used to trap Jackdaw, Crow, Rook, Magpie or Jay. If a Raven or bird of prey is seen in one of these traps it should be released, but you yourself may not be able to do this as the traps in this area are usually padlocked. If a live pigeon is seen in a crow trap, it is likely that the trap is being used to lure birds of prey, which is illegal. In this case report the grid reference of the trap to the Police and / or the RSPB who will probably look to secure evidence to support a prosecution. Another commonly used trap in this area is a spring trap or fen trap, which looks like a mousetrap. These are usually found crossing waterways, on a silver birch log and covered in a wire mesh tunnel. If the trap is covered it is legal. Uncovered traps are sometimes seen on top of a wooden pole, where they are being used to illegally trap birds of prey. Wire snares are legal for trapping rabbits or foxes, as long as the traps are checked every 24 hours. Snares are illegal if used to trap a badger. You may see Birds or animals contaminated with a pesticide or poison and left as bait – This is illegal. If you suspect poisoning do not touch the dead bird/animal. Poisons used tend to be commonly available, but in high concentrations and can be absorbed through the skin. Certain pesticides are toxic by inhalation so it is advisable to approach from up wind. A sign of poisoning is a dead bird next to a dead animal or the animal being in an unlikely situation, such as the top of a wall or summit of a hill. Another sign is a ring of dead flies around the poisoned animal. Report the grid reference to The Police and RSPB as soon as possible. Natural England run a scheme to identify poisons used and prosecutions can result from this analysis. The National Trust owns Kinder and large areas of Bleaklow and Ladybower, generally around the inner edge of the watershed. The one recent case of a gamekeeper being prosecuted did occur on National Trust land, but the situation regarding the National Trust and shooting is complex. The National Trust acquired this land as the result of a bequest and the land came with shooting rights attached, which are in place until 2015. This means that the shooting tenants have rights to manage the heather and use any legal grouse moor management. This situation is very unusual for the National Trust – the high peak is the only upland estate owned by the Trust with shooting rights attached. Obviously the National Trust does have some influence and there is an agreement that gamekeepers will not shoot or harm Arctic Hares – I find it shocking that Arctic Hares have no legal protection whatsoever. So if you see any signs of Arctic Hares having been shot or poisoned, or a dog being used to hunt them, report this to National Trust management as soon as possible. All of the things I’ve described happen in this area, but if you keep to the main paths and routes, you would never know. As fellrunners we go to out of the way places at odd times of day. We are ideally placed to help stamp out this type of illegal activity. Read RSPB’s Peak Malpractice reports for more examples. At all times consider your personal safety, particularly if you decide to challenge the behaviour of any individual. If you speak to Estate Staff ask which estate they belong to and who is their shooting tenant / land agent. There is no harm in asking for names – although you may be refused. REMEMBER if there is a vehicle involved, get the registration number. If you find poison bait and / or what you believe may be an illegal trap, don’t touch it, record a grid reference and description (and digital photograph if possible) and report it to the Police. Going across Kinder on a moonlit night, hard packed snow under foot and no need for a headtorch is one of the best outings I can ever imagine. Many others enjoy the same experience, often as a way to extend moorland running in limited winter daylight. Mountain bikers take a similar view and are often seen out at night. Everybody who accesses the countryside has an impact and over the years DPFR has tried to listen to all concerns and minimise our footprint. Generally the same responsibilities apply if it’s a daytime or night time run but there are some things which are different. Moors are very empty places on an evening, especially so in the dark. I’ve come to realise that people are surprised, even shocked to see a group of runners on otherwise empty land and the first reaction is often that considerable damage must be taking place. It’s a slow process to assuage these fears, but it really just comes down to being prepared to talk to people. Our main interest is getting out onto open moorland, but sometimes there is farmland to negotiate first and this is often where problems arise. Following a footpath is difficult at night, often you can’t see the location of a stile across a large field, so it’s easy to lose the way and end up climbing walls and fences. You need a 1:25 map and a compass bearing to navigate across a field at night. Rights of way often pass straight through a farmyard and given no warning, residents will be shocked to see or hear 20 runners pass their front door. It’s not appropriate for any recreational user to set about asking all landowners permission before setting out, but in this circumstance if a problem is identified then it is necessary to talk to the resident. The simplest way may be to take a different route in future – there is a huge network of footpaths. The easiest way to avoid these problems is simply to choose a start venue that has a choice of routes leading straight onto open access land and for those routes to stay on access land the whole way. On open moorland on a winter night you will see fox, hare and grouse. Traditionally heather is burnt until the middle of April and ground nesting birds will only breed after this time (when daylight extends to around 8.30pm) so there is little or no overlap between the nesting season and night running. Grouse are an essential part of moorland habitat, but we all know they are shot for sport, if there was a conservation concern, shooting would be banned. As well as a general awareness of our impact, we do need to listen to any specific local concerns, some small areas may have a special conservation significance, in which case it’s easy enough to avoid them. At night runners are noticed because of their headtorches and simply the brighter the light the bigger the impact. Cut down the lumens – it can only help. If you’ve read this far, well done, not everybody will have. The only way to make this work is for a few people to take lead when you go out as a group.